The first stage of SpaceX's Falcon 9 rocket attempts to land on the deck of a "drone ship" in the Atlantic Ocean on April 14, 2015. The rocket stage ended up topping and crashing. An amazing new photo shows the first stage of SpaceX's Falcon 9 rocket just before it hit the deck of a robotic ship in the Atlantic Ocean during a bold landing attempt last month. The new image was snapped from the deck of the drone ship on April 14, a second or so before the rocket stage toppled over and exploded in a dramatic demise that SpaceX captured on video. The near-miss was the second in the span of three months for SpaceX, which also tried to bring a Falcon 9 rocket first stage down on the ship — which is named "Just Read the Instructions," after a sentient colony vessel in the novels of sci-fi writer Iain M. Banks — on Jan. 10. Both attempts occurred during successful launches of SpaceX's robotic Dragon cargo capsule toward the International Space Station from Florida's Cape Canaveral Air Force Station. The California-based company holds a $1.9 billion contract to fly at least 12 of these missions for NASA and is currently in the middle of resupply run number six, which will end when Dragon comes back to Earth later this month. 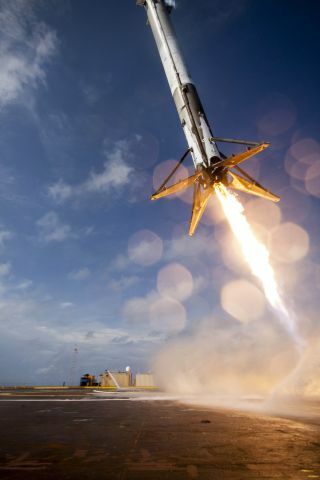 Developing rapidly reusable rockets is a priority for SpaceX and its billionaire founder and CEO, Elon Musk, who has said that such technology could revolutionize spaceflight by dramatically reducing its cost. The January attempt, which also ended in a "hard landing" aboard the ship, failed because the rocket stage's stabilizing grid fins ran out of hydraulic fluid, Musk said. A problem with a throttle valve was responsible for the April 14 crash, he added. SpaceX representatives have said that they will keep trying the Falcon 9 soft landings until they have the maneuver down. The next attempt will come during the next Dragon cargo launch, which is currently scheduled for June 19. Ocean landings, however, are just an intermediate step for SpaceX. The company envisions eventually bringing rocket stages back down on land, close to their launch sites, so they can be inspected, refueled and reflown relatively quickly.